This page is designed to be viewed in 800x600 resolution using medium text. An exterior side view of the Cessna 152 tank that was used in the test. For the test, this tank was configured using a standard installation for a Cessna 152 tank. It was installed in a Cessna 152 Model aircraft that was parked in a normal ground attitude. The test was performed under conditions that simulated a normal preflight check. 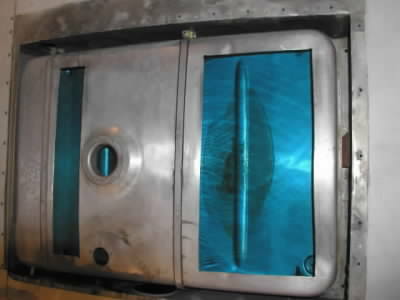 This image is an exterior bottom view of the tank showing the forward fuel pick-up on the top left, the rear fuel pick-up on the top right and the sump drain on the top right. The fuel pick-ups are where the contents of the tank enter into an aircraft's fuel line. The sump drain is used to take fuel samples. 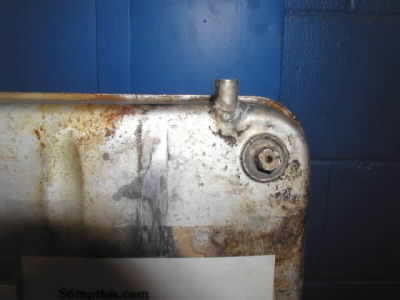 This image is an exterior close-up view of the tank's rear fuel pick-up and sump drain. A tank's sump is a low point located somewhere on the tank's bottom surface to where liquids flow under the force of gravity. An ideal tank design should have a "sump drain" installed at the sump. 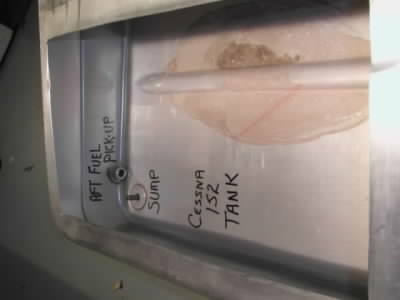 One of the objectives of this test was to determine if the Cessna 152 Tank's sump drain is located at the tank's sump. This image presents an interior view of the Cessna 152 tank that was used in the test. Important areas of the tank are labeled AFT Fuel Pick-up and Sump. 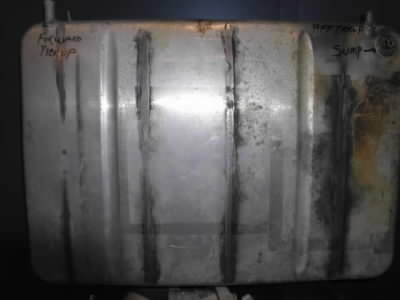 The label Sump in the image is used to identify the Sump Drain, not the tank's sump. 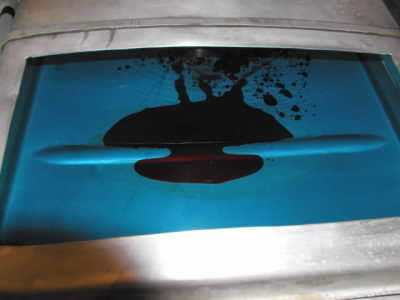 The service history of this tank is unknown, but the oval shaped stained area centered along the tank's rib on the bottom of the tank appears to be where water settled in the tank during periods that the aircraft it serviced was parked in a normal ground attitude, which if true, suggests that the stained area is the tank's sump. This image shows a view of the wing's compartment where the fuel tank used in the test was installed. As seen here, the floor of the compartment is made-up of support joist. The width of these joist vary. The left most joist is about 4-inches wide, the next two joist are each about 5-inches wide and the next joist is about 7 inches wide. The far right joist is about 5-inches wide. 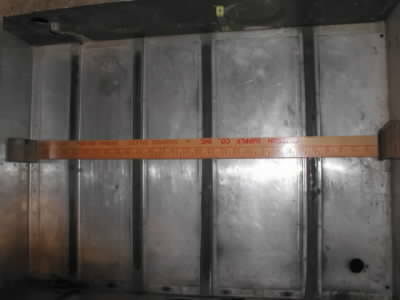 When the test tank was installed, its interior rib that divides the stained area shown above in Image 4 aligned vertically with the 7 inch wide joist at about 8 inches from the right as shown in this image and the next. This image shows that the Cessna 152 tank's rib that extends vertically in this image has its center located about 8 inches from the tank's outer right wall. 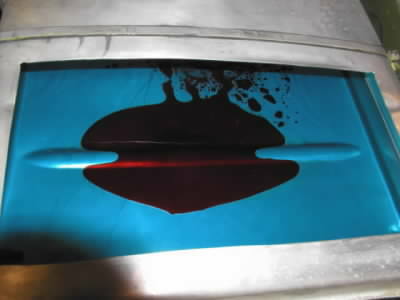 During the test, as water was added to the tank, the water was observed to settle in the stained area, which further suggests that this area is the tank's sump. The stained area may also be an indication that this area of the tank is insufficiently supported by the joist shown in the previous image. 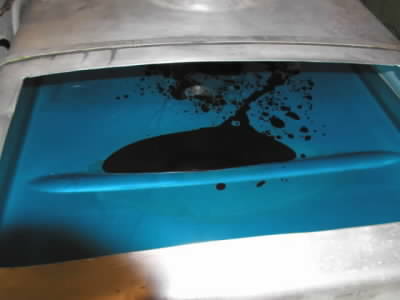 Insufficient support possibly coupled with hard landings in a training aircraft may be factors that could cause the stained area to become the lowest area in the tank. For the test, water was used as a heavier than fuel contaminant. 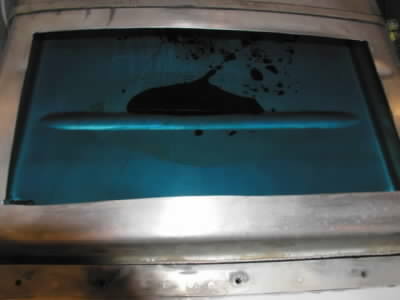 A red color dye was added to water to contrast it against the fuel's blue tinted color, which permitted visual observations to be made about the water's motion and location in the fuel tank. In this image, the Cessna 152 aircraft is parked in a normal ground attitude, and the tank contains 3.0 gallons of fuel with no water. At the start of the test, 2.5 gallons of fuel was added to the tank making the total fuel 5.5 gallons with no water. From here, a 2 ounce quantity of water was added and permitted to settle to the bottom of the tank. Then observations were made that noted where the water settled. Additionally, observations noted the water's location with respect to the sump drain and the aft fuel pick-up. After these observations were made, another 2 ounces of water were added, and more observations were made. In this way, water was incrementally added and permitted to accumulate until the tank contained a total of 68 ounces of water. 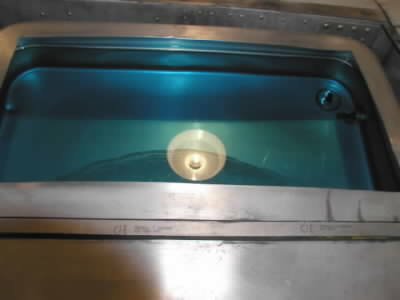 This image shows the first 2 ounces of water being added to the tank. Each 2 ounce quantity was added by pouring it into the tank's filler neck as shown here. 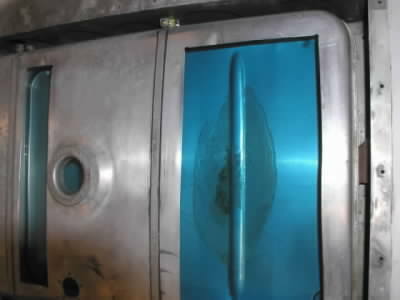 This image shows the tank after the first 2 ounces of water was added and permitted to settle. 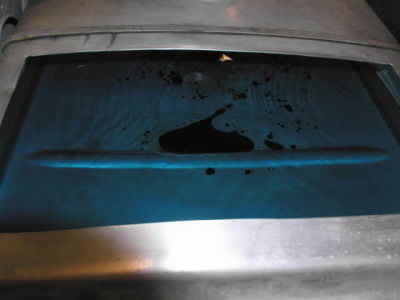 As shown here, a large portion of the 2 ounces of water formed a puddle that appeared to be dammed by the tank's rib. Notice that the puddle and a few scattered globs of water settled in the upper portion of the tank's stained area. 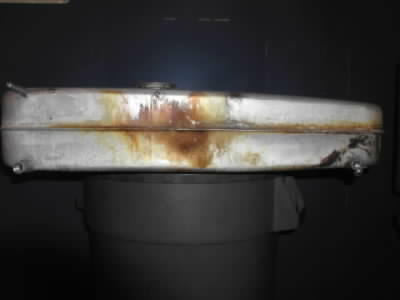 This image is a view of the tank with 2 ounces of settled water as seen from the filler neck from where the water was added. Here, the tank's sump drain and rear fuel pick-up can be seen through the transparent fuel near the upper right area of the image. This view is another perspective of the tank with the same 2 ounces of water shown in the previous images. 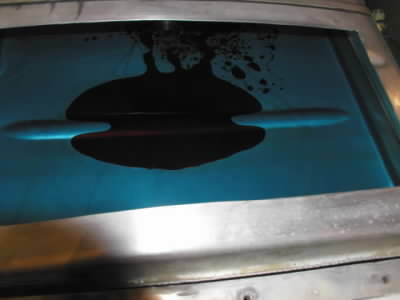 The tank's stained area is also visible. The bright light spot over the near middle part of the stained area is the reflection of an overhead light. 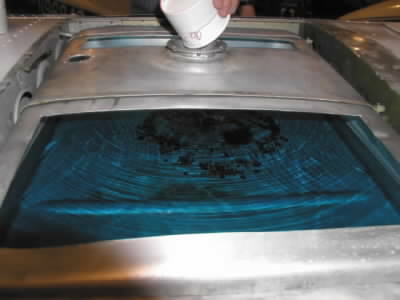 This image shows an additional 2 ounces of water being added to the tank. 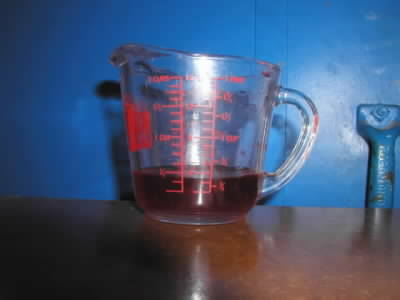 The total water added at this point accumulates to 4 ounces. 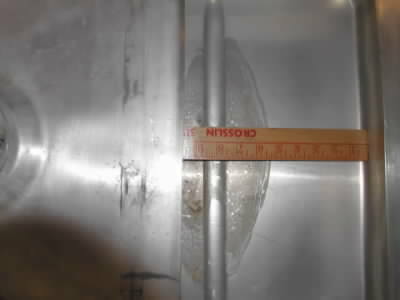 This image shows the 4 ounces of water settled in the bottom of the tank. 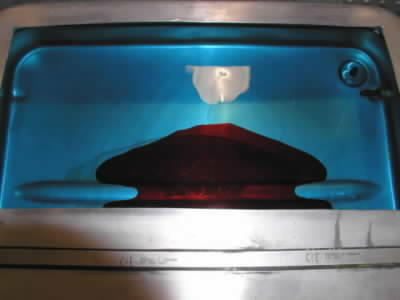 As shown in this image, the red colored water under the influence of gravity has settled in an area that can now be identified as the tank's natural sump for a 4 ounce quantity of water. Notice that the tank's rib extending from left to right blocks a 4 ounce quantity of water from what appears to be a natural gravitational flow from the top of the image toward the bottom of the image. Furthermore, notice that the water has settled in the upper portion of the stained area. 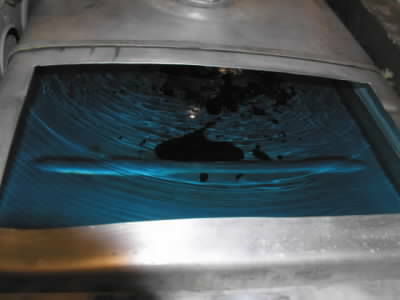 This image is a view of the 4 ounces of settled water as seen from the filler neck. 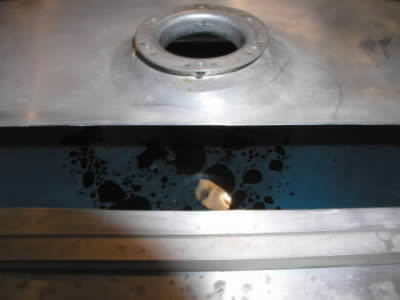 This image is a view of the 4 ounces of settled water with respect to the tank's rear fuel pick-up and sump drain both of which are located in the upper right area of the tank in this image. 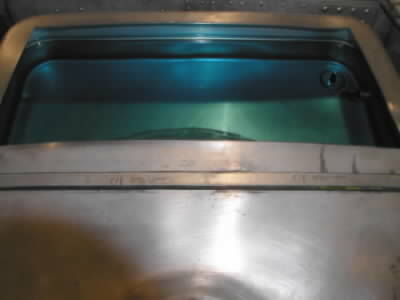 The first 4 ounces of water does not reach the sump drain indicating that the sump drain is not located at the tank's sump. The following images show views of the tank as water was added and permitted to settle in 2 ounce increments. Notice that 8 ounces of water permits flow over the tank's rib into the lower portion of the stained area. With water now on both sides of the tank's rib, the shape of the water appears to be simlar to the shape of the tank's stanied area. 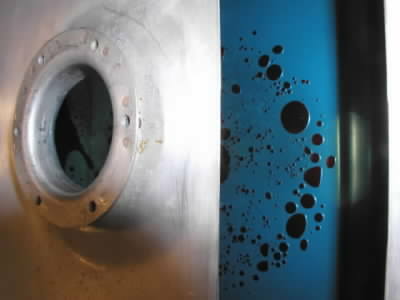 The next row shows Image 4 and this image, Image 16, side-by-side for comparion of the tank's stained area to the 10 ounces of settled water. Image 4: Compare stained area to water (right). Image 16: Compare water to stained area (left). See the next image, Image 18, for another view of this 12 ounces of water. This image shows a view of the tank's rear fuel pick-up and sump drain with respect to the 12 ounces of settled water shown above in Image 17, which has not reached the sump drain.